Fill a 4 qt pot full of water, add potatoes and bring to boil over medium-high heat. Boil for 15-20 minutes, or until the potatoes are fork tender. While the potatoes are cooking, cut the stalks off the top of the fennel (save the fronds), then slice the bulb into thin rings. Toss with olive oil, salt and pepper, place on a baking sheet and cook in the oven for 8-10 minutes, or until the fennel begins to slightly brown. Medium dice the bacon, place in a skillet and cook over medium heat, until crispy. Pour bacon on to a paper towel lined plate to drain off the fat, then place cooked bacon into a small bowl. Once potatoes are cooked, drain into a colander, then pour all ingredients into a large bowl. Season with salt and pepper and toss to mix. As the potato mixture cools slight, using a whisk, beat together 2-3 tbs of kumquat juice, the grain mustard, mayonnaise, and olive oil. Adjust the oil amount to your preferred consistency and season with salt and pepper. 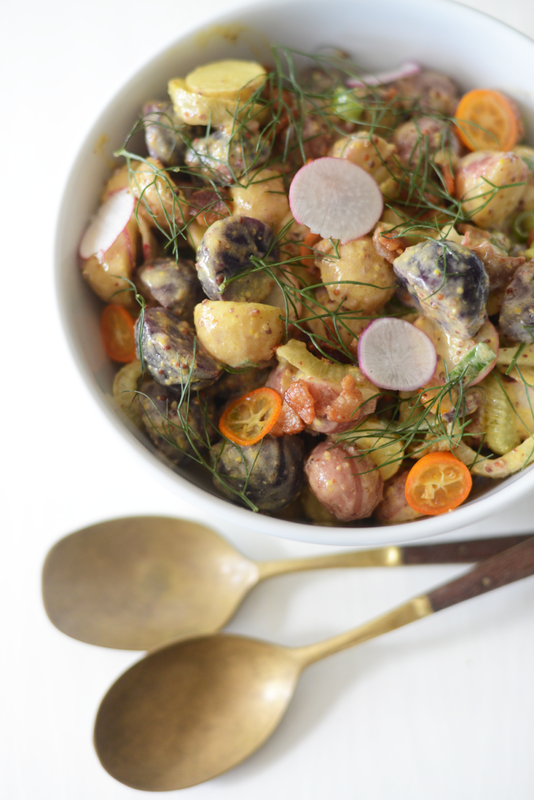 Pour dressing over potatoes, toss to coat, then top with fennel fronds and slices of kumquat. Finish with salt and pepper to taste.